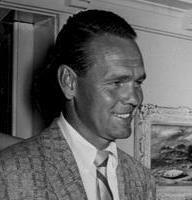 John Albert Kramer (August 1, 1921 – September 12, 2009) was an American tennis player of the 1940s and 1950s. A World No. 1 player for a number of years, and one of the most important people in the establishment of modern men's "Open"-era tennis, he was the leading promoter of professional tennis tours in the 1950s and 1960s. He was a relentless advocate for the establishment of Open Tennis between amateur and professional players. An International Tennis Federation (ITF) proposal to introduce Open tennis lost by five votes in 1960, but became a reality in 1968. In 1970, he created the Mens Grand Prix points system. In 1972, he helped found the Association of Tennis Professionals (ATP) with Donald Dell and Cliff Drysdale, and was the first Executive Director. He was unpaid at his request. In that role, he was the leader of an ATP boycott of Wimbledon in 1973, for the banning of Nikola Pilić from the tournament. Tall and slim, he was the first world-class player to play "the Big Game", a consistent serve-and-volley game, in which he came to the net behind all of his serves, including the second serve. He was particularly known for his powerful serve and forehand, as well as his ability to play "percentage tennis", which he learned from Cliff Roche, a retired railroad engineer, at the Los Angeles Tennis Club (LATC). This strategy maximized his efforts on certain points and in certain games during the course of a match to increase his chances of winning. The key was to hold serve at all costs, which was one of many things that made Kramer one of the greatest players of all time. Kramer was the son of a blue-collar railroad worker for the Union Pacific railroad. As a boy he was a fine all-round athlete, particularly in basketball and tennis. When he was 13, the family moved to San Bernardino, California, and after seeing Ellsworth Vines, then the world's best player, play a match, Kramer decided to concentrate on tennis. In 1944, he married Gloria, and they had five sons: Bob, David, John, Michael and Ron. They lived in Bel Air, California. He invested in the Professional Tennis Tour, two golf courses at the Los Serranos Country Club in Chino Hills, CA, and racehorses. Starting in 1948, the Jack Kramer Autograph tennis racket from Wilson Sporting Goods became the most popular selling racket of all time, over 35 years (Wilson Sporting Goods-1984). He began his tennis career by taking lessons from legendary teaching professional, Arthur Marx, son of Groucho, in the Juniors. Kramer made his debut for the US Davis Cup team in 1939 in the final of the World Group against Australia. Together with Joe Hunt they lost the doubles match against John Bromwich and Adrian Quist. In 1946 and 1947 he was part of the winning US team, defeating Australia in both finals and winning all four of his singles matches. After 1947 he became ineligible to play for the Davis Cup on account of becoming a professional player. He compiled a Davis Cup match record of seven wins and two losses. During World War II, Kramer served in the United States Coast Guard, but continued to win prizes in the United States, since the war had effectively put an end to international tennis. He turned professional in November 1947 to play Bobby Riggs on December 26, 1947 at Madison Square Garden, after winning Wimbledon and the United States Championships in 1947. 15,114 people showed up for the match in one of the worst snow storms in New York history to watch Riggs win. Kramer went on to win the tour with Riggs 69 to 20 and became the top professional for the next six years. He retired in 1954 to promote his Pro Tour. In his 1979 autobiography, The Game: My 40 Years in Tennis, Kramer calls Helen Wills Moody the best women's tennis player that he ever saw. "She was the champion of the world when I was 15 and played her – she won seven Forest Hills and eight Wimbledons.... I beat her, but Helen played a good game." Bobby Riggs and Kramer convinced Sarah Palfrey Cooke and Pauline Betz to turn professional and play matches prior to their main contest. 1947 Australian Championships winner, Dinny Pails, and 4-time US Championships semi finalist, Pancho Segura, also turned professional in late 1947 and played against each other on the undercard of the 1948 Kramer vs. Riggs tour. Forehand Volley: Wilmer Allison and Budge Patty. Kramer's serve and forehand were equal to the best players in the game, but he would not talk about his own strokes. Kramer attended Rollins College in Winter Park, Florida, and he played on the tennis team in the 1941 and 1942 seasons. Pauline Betz was there at the same time. Kramer retired from competitive tennis in 1954 due to arthritic back problems, making brief comebacks on tours with Hoad and Rosewall in the late 1950s. He started working for the BBC as a commentator on the Wimbledon Championships in 1960, a role in which he was very popular because of his intimate off-court knowledge of most of the players. He was paired with Dan Maskell in the commentators booth. However, he was dropped by the BBC in 1973 because of his role in the ATP boycott of Wimbledon that year, which saw 81 players, including defending champion, Stan Smith, stay away from the tournament. The following tennis notables worked for Kramer on his Pro Tour: John Gardner, Olen Parks, Vic Braden, and Myron Mc Namara. Jack Kramer died from a soft tissue cancer on September 12, 2009 at his home in the Bel Air neighborhood of Los Angeles, California. ^ United States Lawn Tennis Association (1972). Official Encyclopedia of Tennis (First Edition), p. 425. ^ "Kramer might have been best ever". Retrieved September 4, 2012. ^ "Analyzing the Greatest Players of All Time". Retrieved September 4, 2012. ^ "A look at Tennis Channel's Top 100". Retrieved September 4, 2012. ^ "Davis Cup – Player profile". ITF. ^ "Jack Kramer". The Daily Telegraph (London). September 14, 2009. Retrieved May 5, 2010. ^ "Jack Kramer Turns Pro for Salary of $50,000". The Milwaukee Journal. November 13, 1947. p. 6. ^ "Bobby Riggs Spoils Jack Kramer's Pro Debut, Winning Garden Match In 4 Sets Before Record Crowd". Times Daily. December 27, 1947. p. 8. ^ Dave Anderson (January 21, 1963). "Tennis In A Blizzard". Sports Illustrated. pp. 77, 78. ^ Bud Collins (2010). The Bud Collins History of Tennis (2nd ed.). [New York]: New Chapter Press. pp. 66, 67. ^ Dwyre, Bill (September 13, 2009). "Jack Kramer, tennis champ and promoter, dies at 88". Los Angeles Times. Retrieved September 13, 2009. ^ "5 Are Selected for Net Honor". The Milwaukee Journal. August 6, 1968. ^ "Tennis Great Jack Kramer Dead at 88". Fox News. September 13, 2009. ^ John Barrett, ed. (1980). World of Tennis : a BP yearbook. London: Queen Anne Press. pp. 100, 101. (1910) Hazel Hotchkiss Wightman/ Joseph Carpenter, Jr.